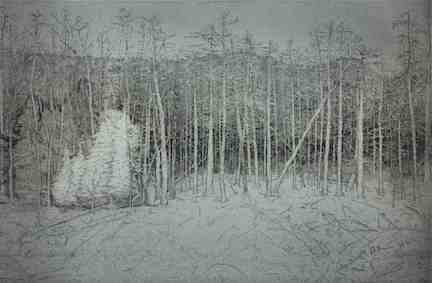 Barbara Edwards Contemporary, Calgary is pleased to present PAPER WORKS. Featuring art from a select group of artists, this exhibition examines how works on paper contribute to the artistic process, including examples of printmaking, collage, drawing, painting, and watercolour. Whether created as preliminary studies or intended as completed artworks, the works on view demonstrate how paper lends itself as a versatile and preferred material for artistic production. PAPER WORKS showcases the work of Eric Fischl, April Gornik, Tyler Bright Hilton, Robert Murray, Jessica Stockholder, and Tim Zuck. Tyler Bright Hilton, "Minmei Madelynne Pryor on the Trail of a Liar. She couldn't see them anymore, but she knew where they were going."